I’m sending midi from gigperformer to Apple mainstage using midipipe software to connect them. I chose midipipe input 2 in the midiout block of gigperformer then mainstage listens on midipipe output 2. In midipipe I have connected that input and output in midipipe. If the midi out block of gigperformer could select the mainstage software directly that would be great. Or if gigperformer could create these virtual midi inputs and outputs to connect software. Is there a way to do this, maybe with gpscript? You are on OSX which has a built in ability to create virtual MIDI ports called IAC (Inter Application Connection). You can create a new port just for this purpose that will always be there. 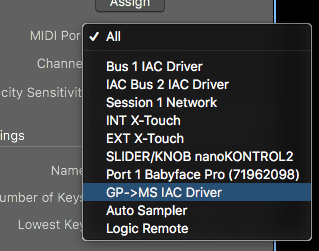 Simply open Audio MIDI Setup application on your Mac, then click on Window->Show MIDI Studio where you’ll find your IAC Driver. Double click on it. So no need to really have any third party applications or complicated setups. Once you’ve done this it’s always there like a permanently connected MIDI device. Thanks for this! I will test this out after tonight’s gig. 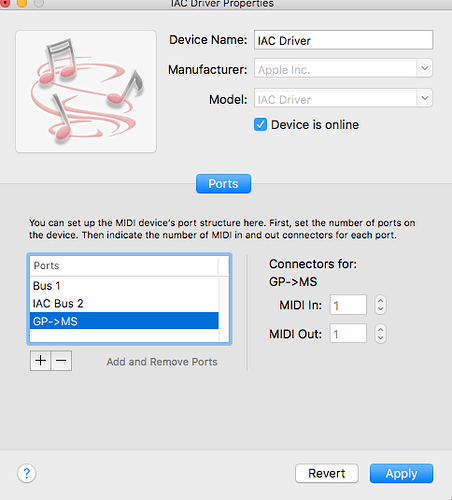 One critical extra point – make sure you do not use a MIDI In (OMNI) block in Gig Performer once you use IAC ports. Instead, just use MIDI In blocks that are directly associated with the MIDI input device you want the use. The reason is that if you send MIDI data out through an IAC port, an OMNI MidiIn Block will receive that MIDI right back in again (because OMNI blocks receive MIDI from all devices) and you’ll create a nasty MIDI loop. Also, I think Mainstage has an AutoSampler (they got this when they bough Redmatica) and you can use that to automatically capture wave files for different notes and velocities which can then be imported into a sampler. SampleRobot is a stand-alone app that can do this as well. Autosampler in MainStage is as easy as it gets when you want to sample internal instruments. The trick is to convert the exs instrument to a format you can use with your sampler of choice. The wav files are saved in a separate folder. I used a 2nd instance of gigperformer for guitar patches but I was having problems w gigperformer crashing. Probably related to use of SampleTank. So with the guitar emulation in a different, app I could at least play guitar and restart gigperformer.